Using state of the art 3d BIM modeling software to product our shop drawings, we are able to gain a significant advantange over other fabricators in our class in time to fabrication, and increased accuracy and productivity. The methodology we use allows us to minimize the amount of fabrication errors that are encountered by outsourcing the detailing process. Our methodology also allows us to efficiently keep a detailed log of all contract documents, submittals, RFIs, fabrication and erection processes with minimal data entry effort. Bandsaw cutting allows us to get clean square cuts without having to manually hand cut with an Oxy/Acetelyne torch. With bandsaw cutting, no additional grinding is required to smooth out cuts as with Oxy/Fuel hand cutting. Using our bandsaws, we're able to cut alrge bundles of tubing for use in ornamental ironwork, or beams up to 18" for structural work. 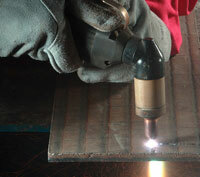 Plasma cutting is prefferred for plate thicknesses of 1" or less. It is fast and easy to setup, just hookup the ground cable to the material to be cut, pull the trigger, and start cutting! No fuel adjustment is necessary, however the correct consumable parts will give the cleanest cuts. The plasma cutting process does not heat up the metal as much as oxy/fuel cutting, and if done correctly will reduce warpage during cutting. For larger, thicker materials oxy/fuel cutting cannot be beat. One can easily cut metals in excess of 10" with the proper setup. We mainly use Oxy/Fuel cutting on beams which are too large to fit on our bandsaws, or plates thicker than 1". We have automated, and semi-automated systems which we use Oxy/Fuel torches on which gives a much cleaner cut than hand-held cutting. 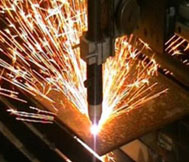 We currently offer automated CNC plasma cutting for plates up to 1" thick and 5' x 10', and automated Oxy/Fuel cutting for plates up to 4" thick. 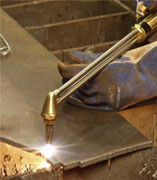 Our semi-automated systems are mechanized torch holders to cut and bevel large beam sections. We are also preparing our shop for an automated robotic beam coping line which will again significantly increase our productivity. We have the equipment necessary to meet any demanding projects needs. Our shop welders are all either AWS or L.A. City certified, and all of our field welders are L.A. City certified. We use mainly the FCAW process with E71T-8 or E70T-6 electrodes for structural welding for their high deposition rates, and flexibility and versatility. We have 6 welding stations ready to serve your projects needs. We also prepare all necessary welding procedures for submittal on all projects. Additonal welding processes available upon request.